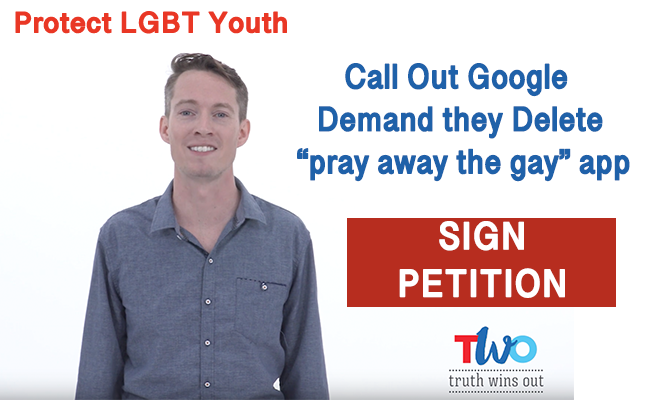 WASHINGTON – Truth Wins Out praised The Human Rights Campaign today for suspending Google from its CorporateEquality Index for refusing to delete a dangerous “pray away the gay” app by Living Hope Ministries that targets LGBTQ youth. Truth Wins Out started a Change.org petition against Google in January that has 142,000 signatures and counting. Nearly a dozen lawmakers from across the nation have also come forward to condemn Google. When Truth Wins Out brought the contents of the app to the attention of Apple, Microsoft and Amazon, the companies pulled it from their online stores. Google, however, has dug in its heels and won’t budge. Hopefully, being suspended from the Human Rights Campaign’s Corporate Equality Index will finally get through to Google’s leadership that they are doing irreparable harm to the company’s reputation. “It is outrageous that Google appears to have slid into the realm of false equivalency where ‘both sides’ are morally equal and where diversity now means allegedly supporting LGBTQ equality, as well as those who fervently oppose it,” said TWO’s Besen. The public officials who have so far urged Google to dump the app are: State Sens. Brad Hoylman, (D-NY), Adam Ebbin (D-VA), Donna Nesselbush, (D-RI), State Reps. Kelly Cassidy, (D-IL) and Brian Sims, (D-PA); City Commissioners Geoff Kors, (D-Palm Springs-CA), Ryan Mellow (D-Tacoma, WA), Patty Sheehan (D-Orlando, FL) and Denise Simmons (D-Cambridge, MA); Mayor Sean Strub (D-Milford, PA); and Register of Wills Byron Macfarlane (D- Howard County, MD). TWO sent Google CEO Sundar Pichai an open letter on December 27, explicitly outlining how the app was offensive, dangerous and likely violated the company’s policies. “It’s time for Google to join Apple, Microsoft and Amazon to delete this heinous app that promotes prejudice and fosters discrimination,” said TWO’s Besen.